Identifying different types of energy and how energy chains are formed is a fundamental part of physics. In these activities we are building on pupils’ knowledge of energy in a fun and collaborative way. 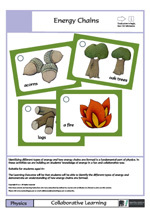 Learning Outcomes: Pupils will be able to identify the different types of energy and demonstrate an understanding of how energy chains are formed. 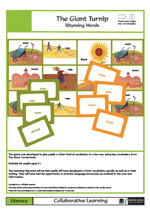 This game was developed to give pupils a richer level of vocabulary in a fun way. For the synonyms game we have concentrated on four feelings: happy, sad, angry and scared. You can adapt this game to include other feelings or translate the feelings into different languages. Learning Outcomes: Pupils will have developed a richer vocabulary for expressing feelings either aurally or in their writing. They will also have worked collaboratively with their partner. 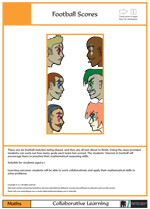 Students have the challenge of sorting out two sets of information to get the right football results. The only way that they can do this is by exchanging information individually or in pairs. The activity encourages collaboration as well as mathematical logic. Learning Outcomes: Students will be able to work collaboratively and apply their mathematical skills to solve a problem. Four in a Row is a fun way for pupils to practise their mental arithmetic either by adding or subtracting numbers while playing Connect Four. To vary the activity it can be played speaking the numbers in different languages or using different number systems. Learning Outcomes: Pupils will be able to add and subtract simple numbers in their head without use of calculators. 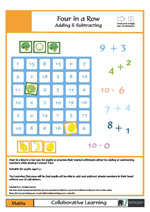 Fractions can be quite daunting for some students, so this game has been devised to help them recognise the value of fractions both in words and numbers. 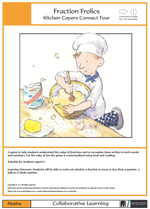 We have related the activity to food and cooking, so students will also be inventing some original fun dishes. Learning Outcomes: Students will be able to work out whether a fraction is more or less than a quarter, a half or a whole number. The English language has some awkward, un-phonetic words which some children have trouble identifying and spelling, even when they are older. 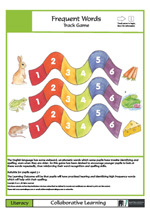 So this game has been devised to encourage young children to look at these words repeatedly, thus reinforcing their word recognition and spelling skills.Learning Outcomes: Children will have practised hearing and identifying high frequency words which will help with their spelling. This game was developed for pupils to explore and learn about the basics of hygiene; how germs are transmitted, and that they can make us ill. 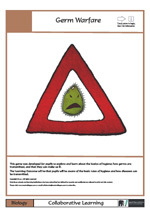 The importance of how germs are spread has been highlighted by various campaigns to reduce the infection rate of many illnesses world wide.­ You might want to make your own variation of the game cards to reflect other hygiene issues in your environment. Learning Outcomes: Pupils will be aware of the basic rules of hygiene and how diseases can be transmitted. This game was developed to give pupils a richer level of vocabulary in a fun way. It is best to first read The Giant Turnip book before starting the game. If you wish you can hear the story in various languages with your TalkingPEN and the appropriate audio files. Visit www.mantralingua.com for details. To further develop the theme of this book you can also use the companion activity Giant Turnip Bingo.Learning Outcomes: Pupils will have developed a richer vocabulary aurally as well as in their writing. They will also have worked collaboratively with their partner. 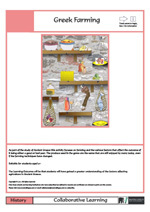 As part of the study of Ancient Greece this activity focuses on farming and the various factors that affect the outcome of it being either a good or bad year. The produce used in the game are the same that are still enjoyed by many today, even if the farming techniques have changed.Learning Outcomes: Students will have gained a greater understanding of the factors affecting agriculture in Ancient Greece. This game was designed to build confidence in producing poetry and also encourage speaking and listening skills. 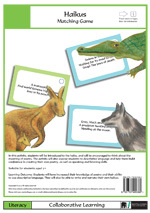 We have used animal haikus as the theme but you can adapt the activity to other themes or languages. Some cards have been left blank so that pupils can add their own animal haikus.Learning Outcomes: Pupils will be able to write and narrate their own haikus. They will also have worked collaboratively with their partner.